When you call a method, you need to check if it can be completed and handle possible exceptions. Often methods can be completed only if you have appropriate access permissions – you need to take this into account too. To avoid double-checks and allow calling the methods from anywhere in ELMA (e.g. scripts, web application, external systems), you need to work with objects using their actions. These keys on their own have no logic - you define it in the methods of entity managers. To show that a method implements an action, you need to mark this method with EleWise.ELMA.Actions.ActionMethodAttribute. Note that the method is marked as virtual and public – you need to do this to ensure that it will work properly. However, this is not enough. We also need to define the access permissions and other criteria required for completing the action. You define the set of permissions when you create a module. In our case, we defined that only users with Users Administration permission can block users. Then you need to check if the user that you want to block is active and make sure that it is not the administrator’s account. For that, you need to create another method with an exactly the same set of parameters. This method will return the bool value. We also need to mark this method with EleWise.ELMA.Actions.ActionCheckAttribute and specify the same action as we did for the main (Block) method. Just as the main method, this method must be marked as virtual and public/protected. Now when we call the UserManager.Instance.Block(user) method, ELMA will check if the executor has appropriate access permissions first, then CanBlock method will be called to check if additional criteria are met, and only after that ELMA will execute the action. 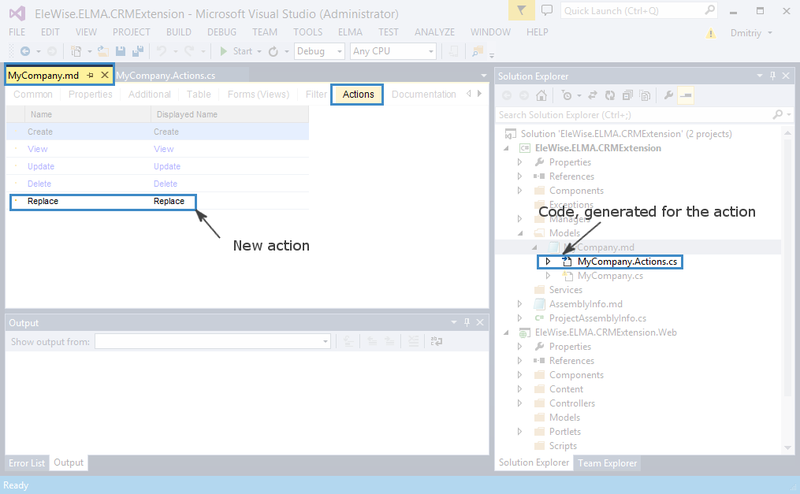 As you can see, the examples above use objects of the IAuditObject and IAuditAction types. These objects link the actions and events in such a way, that these actions can be executed for any object or event in ELMA. You can learn more about EleWise.ELMA.Actions.ActionDispatcherService in ELMA API help.